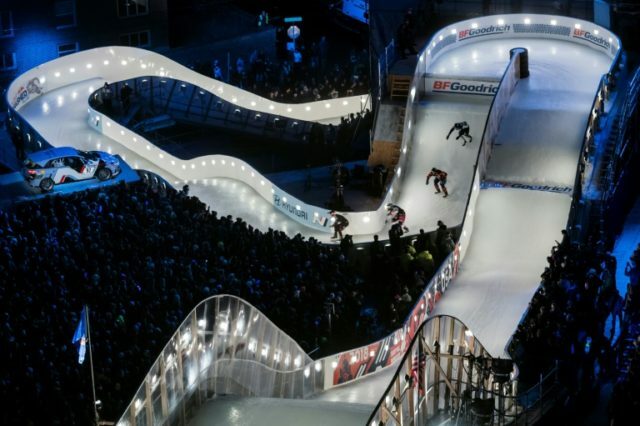 Saint Paul (AFP) – Crashed Ice is a spectacular sport where four heavily padded skaters burst from traps to descend a narrow, winding 400m-long iced course in night-time races where collisions and mid-air crashes are part of the attraction. The 15-year-old sport is the brainchild of energy drink company Red Bull, who harness the enthusiasm and adrenaline burn of extreme sports to market their product. The sport is not entirely dissimilar in concept to boardercross, the snowboard event which has been on the Olympic roster since Turin 2006. But this is a far more frantic, gung-ho affair where the random chaos of four youths hurtling at 60km per hour, elbow to elbow, in a 45-second race in specially constructed urban settings is accompanied by pumping music and wild crowds. “It’s a kind of mix of all the sports I was into and played while I was growing up. There’s the speed obviously and then there’s the jumps. It’s all more technical than you might think,” double world champion Cameron Naasz, who lives close to Saint Paul where events have been staged for over a decade, told AFP. “What’s great is all the stuff that makes it so spectacular. A wild race right through the centre of town and in front of a historic monument (the St Paul cathedral) and with 100,000 spectators, it’s just huge,” he explains. The city has pulled out all the stops with lights, music and giant screens helping set the stage for the race itself. Massed all along the side of the route down which the competitors descend, fans bang on the side-hoardings to egg the skaters on, with the immediate proximity of the public creating a huge buzz. And over the years this spectacular has won over fans in more and more locations. The world circuit was established in 2010 and secondary competitions are now thriving too. There is an international federation — the ATSX was founded in 2015 and has 3,000 registered athletes from 40 nations with even Brazilians taking part in this new winter sport. Events are also scheduled to take place for the first time in China, with Beijing and Shanghai on the roster. Many of the sport’s fans hail from an ice hockey background but also from the short-track speed skating world and the snowboard and figure-skating scenes. There is a spillover effect and youngsters can be found training up in the sport at skate parks and ice-rinks. There are even a few professionals who live on sponsorship deals, although the prize money for winning a race is still just $2000 for a man and half that for a woman. Most of the participants have a profession, such as Austria’s Alice Senz who is a physiotherapist, or the Canadian firefighter Scott Coxhall. Meanwhile, Canada’s double world champion Jacqueline Legere, 26, works as a stuntwoman when not on the piste. “When I told my mother I was signed up for Crashed Ice she said ‘no way’, but now she’s my biggest fan,” she told AFP. For now the sport is on the rise and with a well financed structure they are aiming for the top, with the Olympics a distant but growing possibility.